I’ve made boozy spiced hot cider and I’ve made mulled wine and finally was introduced to Glogg at a party a few weeks ago. I heard about a couple of years ago but hadn’t gotten around to making. I decided to make this Scandinavian twist on spiced wine for our own party and found this recipe on NPR, so I decided to give it a shot. 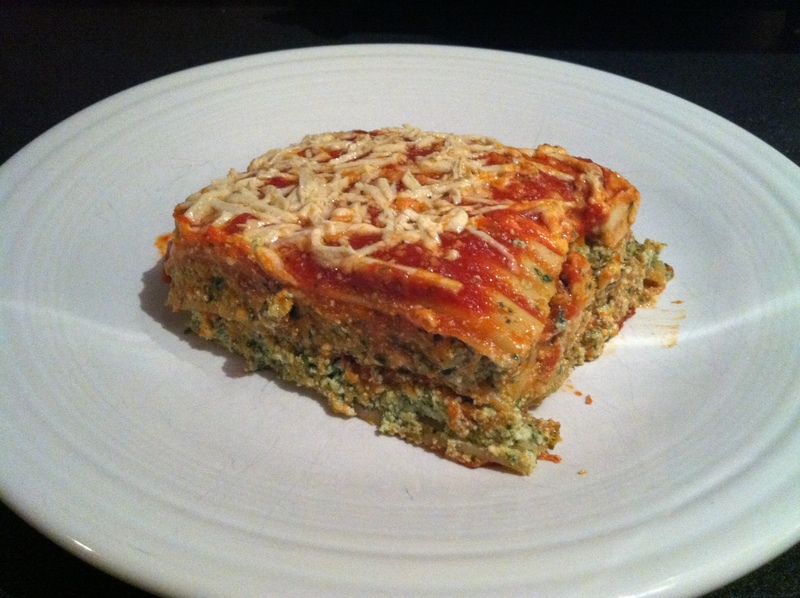 I made a double batch, threw it in the crockpot and it was a hit! All gone by the end of the night. I’ll definitely be making it again. 1. Soak 1/2 c. of raisins in 1 c. of aquavit (a Norwegian spirit made with potatoes); Brandy or vodka can be used instead. I grabbed some relatively cheap vodka at the store. Soak for 30 minutes before Step 2. 2. Put a large pot on the stove, over high heat. Add 1 c. of water and sugar to the pot, and stir with a wooden spoon until the sugar is completely dissolved. 3. Lower the heat to medium and add your spices – two sticks of cinnamon (each broken in half); four whole cloves; six whole cardamom pods, crushed by hand; a thinly shaved orange peel (I used this type of zester); and one small piece of ginger, peeled and cut in half. I used little cheesecloth bags that I had on hand and tossed them in). Stir again with wooden spoon. Do not allow the mix to come to a boil from this point on. 4. Add the aquavit-raisin mixture, two cups of burgundy or pinot noir wine and two cups of port wine. At the suggestion of my “wine guy,” I got a a large bottle of affordable red (“affordable” meaning about $12 for a huge bottle), which was about 7 c. of wine. I needed 8 for a double batch, so I added 1 more cup when the first bottle of the night opened. I highly doubt it makes a huge different to have the specific types of wine listed above. I’m sure it’s delicious, but I think everyone at the party last weekend enjoyed it just the same. 5. Sweeten and spice to taste (I just left it as it was). 6. Strain, garnish with raisins and slices of blanched almond — and serve hot off the stove OR you can do what I did. I strained out the raisins (actually craisins — I mistakenly thought I had raisins, but I think these were just fine!) as I poured the mixture into the crockpot. I added the spice bags to the crockpot as well. I think without the spices being in bags, I would have had to pick through the fruit to get rid of the spices AND I liked that I was continuing to spice the Glogg all night. I put a bowl of the boozy craisins and a bowl of blanched almonds nearby, with a sign telling people to garnish their Glogg with them. A note from the original recipe: The drink can be made a day ahead and kept covered, on the stove, at room temperature. Just reheat before serving. While discussing what I was going to make for our annual holiday party last week, a friend shared this appetizer idea she had come across online. 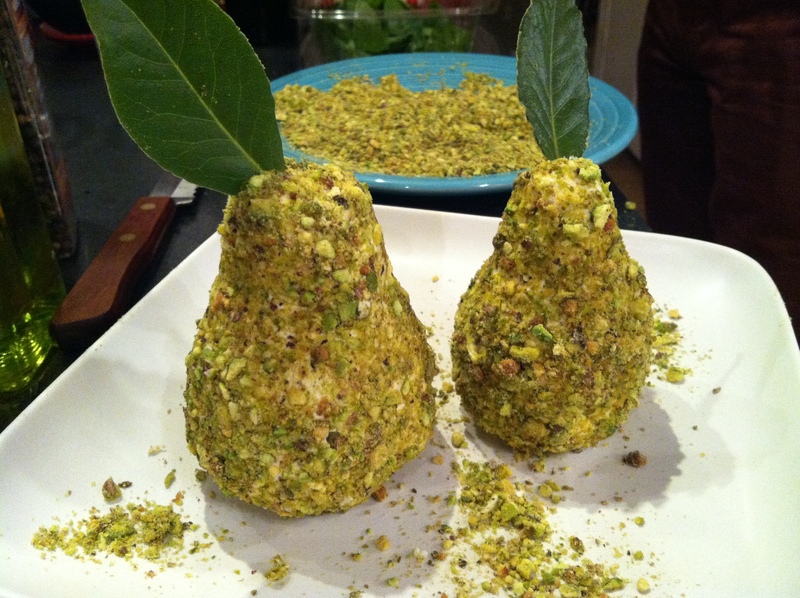 Sculpt goat cheese into a pear shape, roll in ground pistachios and adorn with a basil leaf. I bought one large log of plain goat cheese and a scoopful of bulk shelled pistachios (which was MORE than enough). I already had fresh bay leaves at home, which stood up much better and look more pear leaf-like than the large basil leaves I purchased for something else that day. I’m not much of an artist and after struggling with the cheese for a minute, an acquaintance who had arrived to the party a bit early mentioned her fine arts degree and I handed the cheese right over! (Well, I gave her a pair of gloves first…). We made two pears, one slightly larger than the other, rolled them in the pistachios, which I ground up a mini food processor, and added the bay leaves. Serve with crackers and there you go. Although you might have to dig into one of the pears to get it started like we did — they looked so cute, nobody wanted to be the first one to dig in! When I first started dating my husband he pretended he had the desire to learn to cook, so that first Christmas I got him the Student’s Vegetarian Cookbook . All of the recipes are budget-conscious, have only a handful of ingredients and are easy to make. It’s a great, simple cookbook for both those just starting to cook or just starting to eat vegetarian. I had him pick what he wanted to learn how to make first and he chose a simple black bean and sweet potato quesadilla recipe. Well, he opted to paint his daughter’s room during our “class” but popped out every now and again to check the status and pretend to be absorbing my instruction. Six years later, I’m still the one making the quesadillas, but that’s OK. I made some tonight inspired by that first simple recipe. Still delicious after all these years. 1. Dice, chop, etc. all vegetables as noted above. Feel free to add more or less of any given ingredient. 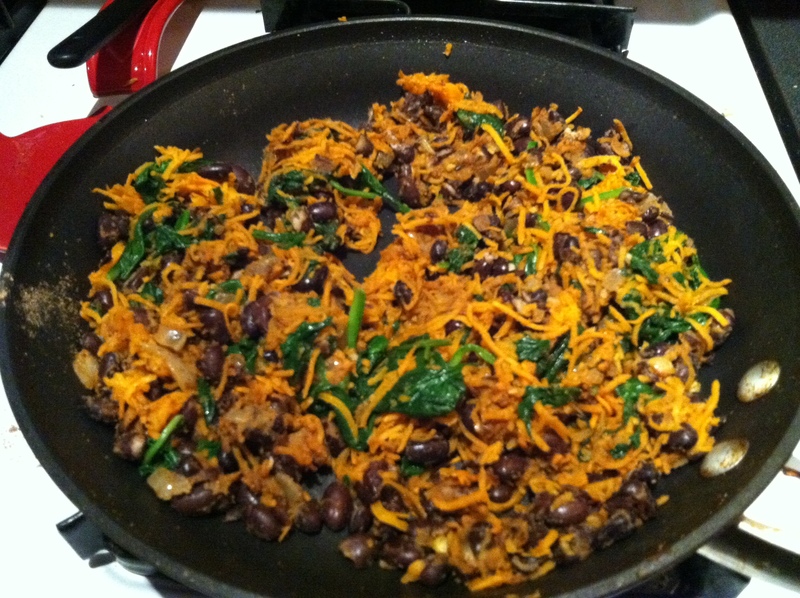 For the sweet potato, use a box grater or the grater plate on your food processor. I finally got to use the grater on my new Magimix three-bowl food processor. Worked great and took about 5 seconds. 2. Add a small amount of oil to a saute pan (1 Tbsp. should do it). Saute onion until beginning to soften, then add garlic and cook for about one minute. This would be a good time to toss in some minced jalapeno or other hot peppers if you’re into that kind of thing. 3. Add grated sweet potatoes and saute until soft (you can always smell when they’re done too — when it starts to smell like sweet potato fries, you’re good!). Add spices and spinach and cook until spinach is wilted. 4. Add beans and lightly mash with a potato masher or fork. This isn’t a must, but if you mash them they help form the glue that keeps the two sides of the quesadilla together/keep the ingredients inside the quesadilla AND it can be a vehicle to sneak other veggies in there. Oh — and feel free to use whatever peans you have on hand — black bean, pinto, white beans, you name it. The more they’re all mashed together, the less the little ones in your life will take note of all the goodness they’re ingesting. I stopped here tonight, but you could finely dice just about anything and include it. If you’re trying to sneak things, you could use cauliflower, which smushes up really well with other things. 5. When it’s all cooked up to your liking, heat a griddle pan or another large sauté pan over medium heat (or if you’ve only got one pan, just remove the contents to a bowl and use the same one). You can spray the pan with an olive oil mister or something. but it’s not technically necessary. Then, build your quesadilla. I lay one large flour tortilla down and put a small sprinkle of cheese down (again — more glue). Put a layer of filling from the other pan. I try to spread it out evenly and get pretty close to the edge. I then top with a good amount of cheese and another tortilla. 6. Let it sit until the bottom starts to brown. Using a large spatula, quickly flip over. If you’ve mashed the beans, etc., not too much stuff should fly out mid-flip. If you’ve got whole beans in there, beware! 7. 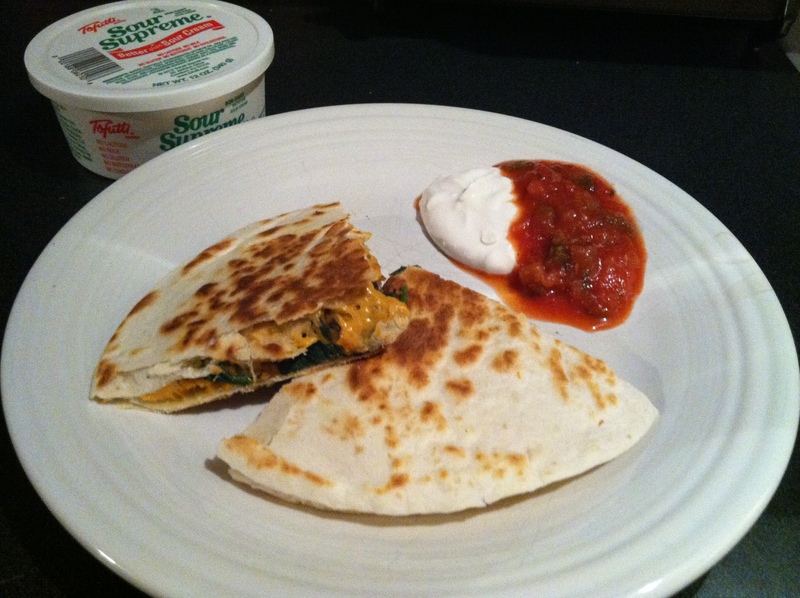 Continue to cook until the cheese is all melty and the bottom tortilla starts to brown and get a little crispy. Remove onto a cutting board and cut into four wedges (I prefer using a pizza cutter). 8. Serve with salsa, hot sauce, guacamole or sour cream (I went with Toffutti Sour Supreme vegan sour cream tonight and Newman’s Own Medium Roasted Garlic Salsa. Delish! These store really well in the refrigerator and can easily heat up again in the microwave or on the stove top. You can even send them with the kids to school!